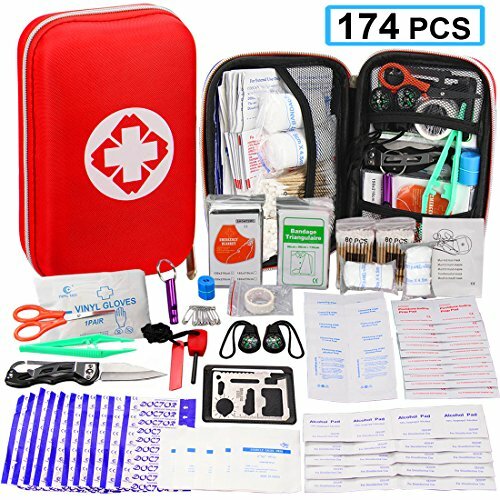 1.【A Must Have First Aid Kit For Your Active Life!】 Monoki 174 Pcs First Aid Kit with Emergency Survival Tools & All-Purpose Hihgest Standards Medical Trauma Supplies. 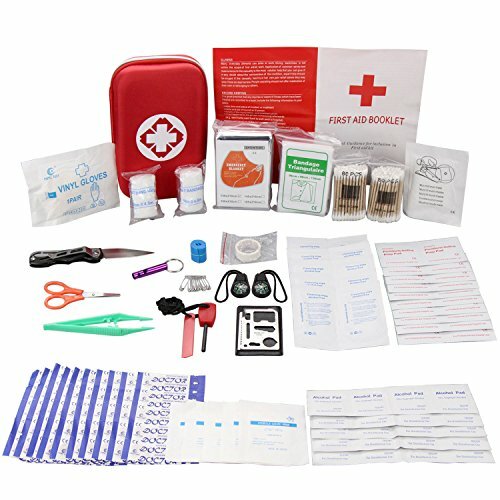 Complete First Aid Kit with Bright Red Bag and Striking Red Cross Symbol, You can Quicky Find Everything You Need in Case of Any Emergency. A Must Have for Us! Also Great for A Gift! 2.【168 Pcs Multi-Purpose Emergency Medical Grade Supplies】 The First Response Medical Supplies Premium Compact First Aid Kit has Everything You Need for a Medical Emergency in a Compact Portable Size. 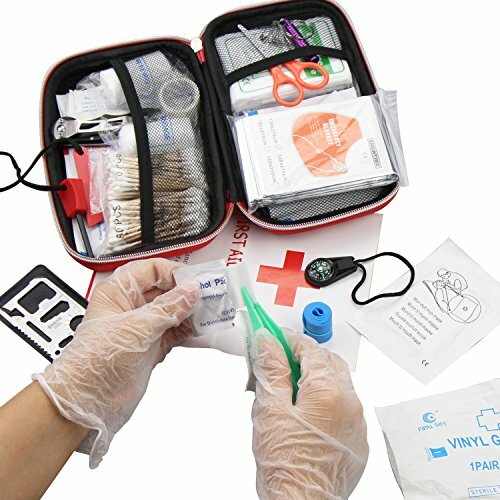 With a Full Range of High Quality Medical Emergency First Aid Choices, You will have Everything You Need for the Most Common Mishaps and First Aid Demand. 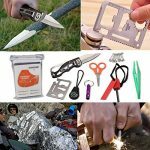 3.【6 Pcs Practical Survival Tool Kits】 Includes Six Different Amazing Survival Tool – Stainless Steel Versatile Tool Card, Fire Starter, Compass, Emergency Whistle, Tactical Folding Knife, Sliver Emergency Blanket. Which can Meet Your Different Needs! Great for Any Emergency Situation! 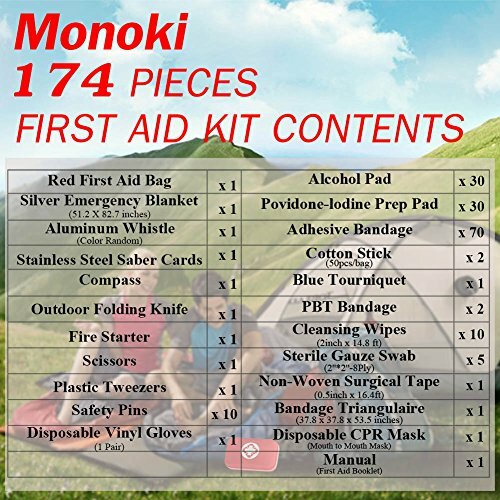 ✪ Monoki First Aid kit includes essential survival items, it can help you in an emergency, handle minor wounds, and even save your life! 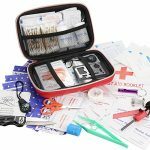 ✪ You need this mini survival kit for life’s unexpected events! You can take it anywhere you go! 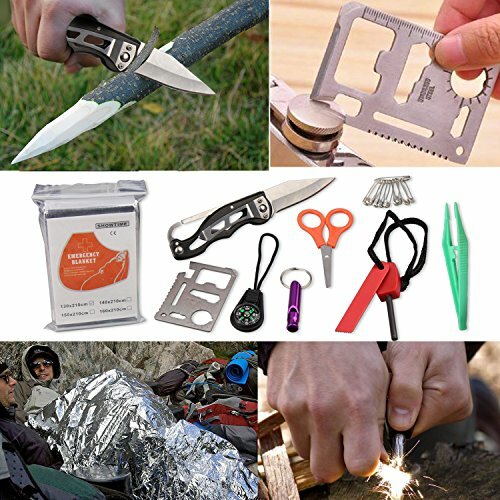 ✪ Perfect gift for camping, hiking, travel, outdoor sports, family and unexpected emergency. Be Prepared for Any Emergencies! 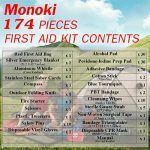 What Makes Monoki First Aid Kit Different? ✔ Durable, waterproof, shock resistant, high-quality EVA, Nylon material. ✔ High-quality full open zipper makes you easy to pick-and-place these items. ✔ Bright red bag and striking cross symbol makes the kit easy to find in an emergency case. ✔ The internal grid design keeps the content clean and safe when you use it. 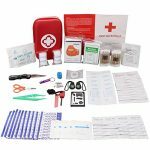 ● 1 x Silver Emergency Blanket(51.2 X 82.7 inches); 1 x Aluminum Whistle(Color Random); 1 x Stainless Steel Saber Cards; 1 x Compass; 1 x Outdoor Folding Knife; 1 x Fire Starter. 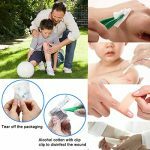 ● 1 x Scissors; 1 x Plastic Tweezers; 10 x Safety Pins; 1 x Disposable Vinyl Gloves(1 Pair). ● 1 x Blue Tourniquet; 1 x Bandage Triangulaire (37.8 x 37.8 x 53.5 inches); 1 x Disposable CPR Mask (Mouth to Mouth Mask); 1 x Non-Woven Surgical Tape (0.5inch x 16.4ft); 2 x Cotton Stick (50pcs/bag); 2 x PBT Bandage (5cm * 4.5m)/(2inch x 14.8 ft); 5 x Sterile Gauze Swab (2”*2”-8Ply); 10 x Cleansing Wipes; 30 x Alcohol Pad; 30 x Povidone-lodine Prep Pad; 70 x Adhesive Bandage. 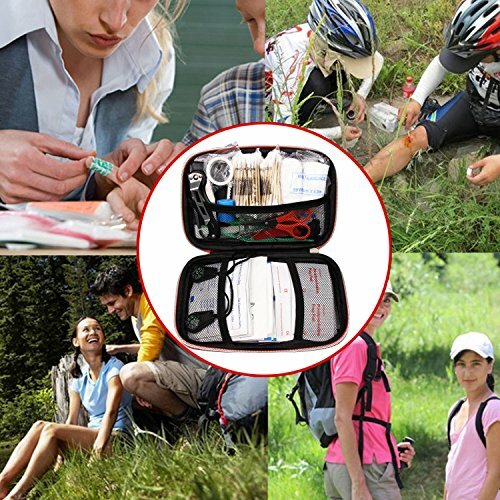 4.【Compact Lightweight & Durable】 Fully Organized with 174 Pieces First Aid Kit, Small and Lightweight, Easy to Carry, Weighs just about 1lb, Portable and Travel-friendly Design. High-quality EVA & Nylon Material with Full Open Zipper, Strong Durable Waterproof and Shock Resistant. Fits Perfectly in your Car, Boat, Backpack, Pockets or Glove Box. You can Take it Anywhere You Go! 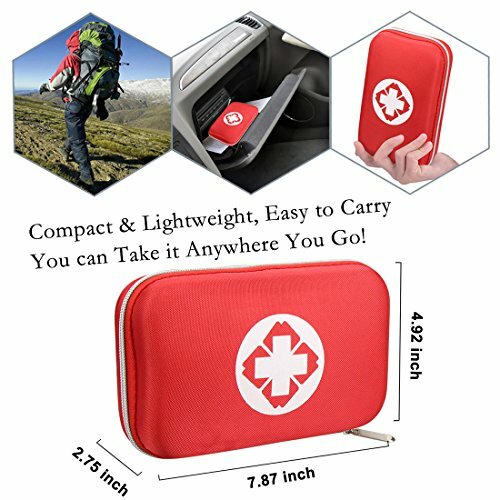 5.【Perfect for Any Emergency Situation】 Ideal for Home, Family, Office, School, Kitchen, Workplace; Car, Boat, Bike, Motorcycle; Travel, Camping, Hiking, Fishing, Hunting, Boating, Cycling, Backpacking, Outdoor Sports, Wilderness Adventures, Also Suit for Natural Disasters Survival Emergency, like Earthquakes, Hurricanes, Tornados, Floods and Fires.